released Android 7.0 Nougat for their Android Smartphone. We already posted many Samsung phones nougat Firmware. And here is the stock A510FXXU4CQG7 Galaxy A5 2016 SM-A510F Nougat Firmware. This stock firmware based on Android 7.0 Nougat with Samsung TouchWiz UI. This stock Firmware will help you to recover from hard brick and install stock ROM on Galaxy A5 2016 SM-510F, also update latest version security patch. This official Firmware can be flashable via Odin. Samsung Released Samsung Galaxy A5 (2016) smartphone with Android v5.1.1 (Lollipop). Galaxy A5 (2016) runs 1.6GHz octa-core it comes with 2GB of RAM. This device has 16 GB internal storage. This device has 5.2 inches Super AMOLED capacitive touchscreen with a resolution of 1080 x 1920 pixels display. Galaxy A5 (2016) packs 13-megapixel rare camera & 5-megapixel front camera. This update comes with latest March [01.06.2017] security patch update. We provide full speed download link of Nougat update for Galaxy A5 2016 SM-A510F. 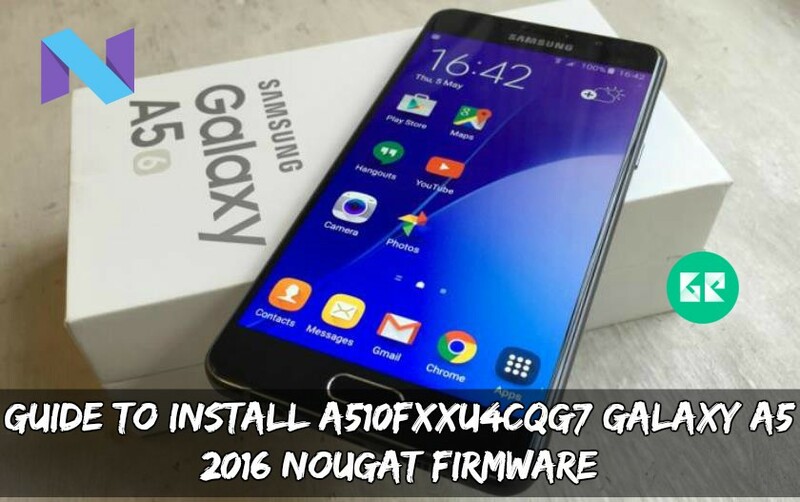 If you want to update your device to nougat then this A510FXXU4CQG7 A5 2016 SM-A510F Nougat firmware gives you that opportunity. The firmware is only available for the A5 2016 SM-A510F. You can install it via Samsung Odin tool or Samsung Kies. We will guide you how to install via Odin. Make sure your device model no is SM-A510F. Download and Odin and Firmware. First, extract Odin.zip and A510FXXU4CQG7 firmware.zip via 7zip. Note: The first time it takes 5-10 Minutes to boot your device.